A Private Home furnished by a local interior designer in a sophisticated country style awaits you! Conveniently located one block from Main Street, walk to dining, shops and art galleries. The Point Reyes National Seashore, beaches and Point Reyes Lighthouse are only a short drive away. Relax at Lavender House for a week and experience all the unique local specialties Point Reyes has to offer; Cowgirl Creamery, locally baked Brickmaiden Breads, Bovine Bakery, Point Reyes Books, Cabaline General Store, Viewpoints, and of course Toby’s Feed Barn, host of the Saturday Farmer’s Market. Small but efficient kitchen with granite counters, wood cabinets stocked with dishes and basic condiments. Breakfast Room faces back garden and dining deck. High chair available. Nearby at San Geronomio Valley Golf or Indian Valley in Novato. Spa for guests over 12 years old and accompanied by adults if under 18. Guests are responsible to add chlorine granules at each use to maintain disinfectant level required. About the House: please read our reviews. About the Area: We are in the town of Point Reyes Station, only a one block walk to art galleries, shops and excellent dining. Point Reyes Lighthouse, Point Reyes National Seashore, beaches & hiking trails and Tomales Bay State Park are only a short drive away. www.nps.gov/pore/index.htm www.parks.ca.gov/?page_id=470 Electric Vehicle Charging: POINT REYES STATION, CA – Three electric vehicle (EV) charging stations have been installed at the Bear Valley Visitor Center parking lot at Point Reyes National Seashore and they are available and free to the public. We SOO enjoyed staying at the Lavender House Cottage in Point Reyes Station. The house was just perfect as a base for my husband, son and I as we explored the Point Reyes National Seashore, Stinson Beach, Muir Woods and Petaluma area. We stayed four nights and thoroughly enjoyed ourselves. The kitchen was well-equipped and the Brie cheese and crackers waiting for us upon our arrival was a sweet touch. Communication and check-in instructions were easy and Eileen was very helpful. It was so quiet and the beds were quite comfortable. We loved the old clawfoot tub in the bathroom. We live in a 1912 home ourselves so we felt right at home in this lovely house. Being in the town of Point Reyes Station was an added bonus as we could walk to the shops - LOVED the Bovine Bakery! I wish we could have enjoyed the hot tub but we had rainy nights when we were there. However, the wet weather just added to the charm of this quaint cottage, and we were quite content and cozy, reading and putting together a jigsaw puzzle. We'd stay here again in a heartbeat! Thank you so much for sharing your sweet cottage with us. Thank you..... so happy you enjoyed the cottage and we look forward to your return. 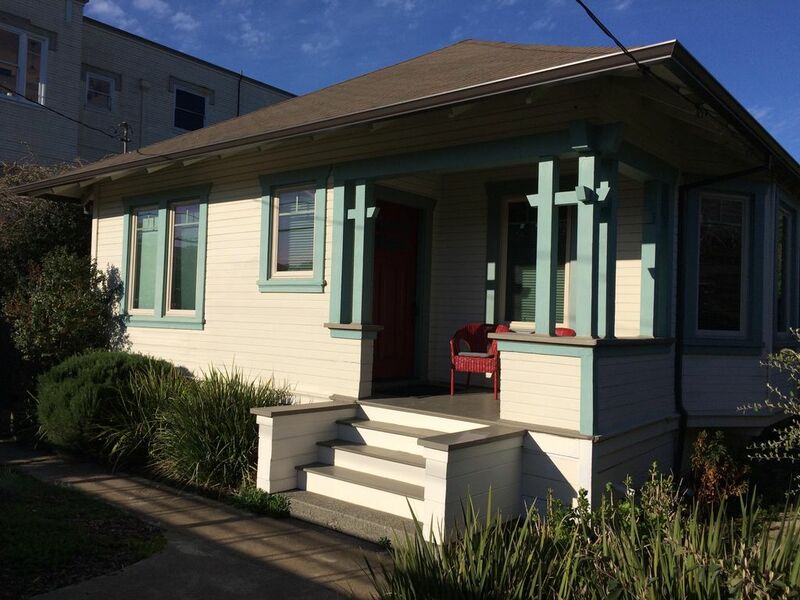 Lovely and charming cottage right near downtown Point Reyes Station. We loved that we could walk to dinner at night and Bovine Bakery in the morning. Easy access to hikes and other points of interest (viewing of elephant seals at beach!). Eileen and Martin have clearly thought about the comfort of their guests, providing all sorts of amenities from flip flops to get to the hot tub to oxygen pillows to coffee for the morning. The hot tub in the private oasis of a backyard was perfect after a day of hiking. Clean, quaint, bright, and cheerful! We love the Lavender House for many reasons. It's super close to downtown Point Reyes Station and we love walking to dinner and strolling along main street for window shopping, coffee, and treats. Gorgeous beaches and scenic hikes are just a short car ride away. This place relaxes us like no other! We loved our stay at Lavender House. Eileen has thought of everything to may your say comfortable. And SO comfortable. The bedding, towels, dishes...everything was perfect. We hope to make our stay a tradition! Our main attraction is the Point Reyes National Seashore, a National Park, and Tomales Bay State Park of California. Both offer incredible vistas, hiking and bicycling opportunities. The National Park has miles of Pacific Ocean beach and cliffs as well as a Lighthouse and wonderful Park Headquarters display of the varied sights to see on your visit. Acceptance of Terms of Rental is required prior to reservation. This is a Non-Smoking property. Holidays are Priced at Weekend Rate. Rates are subject to change, only reserved rates are confirmed. Owner for Approval for one well behaved dog. Additional Fee will apply if approved.